Ustilago is a yeast that inhabits the soil and plant material. It is a pathogen of seeds and flowers of cereals, wheat, corn, and grasses. Its association with human disease is unclear and it has been isolated as the causative agent in only a very few reports. The genus Ustilago has one active species, Ustilago maydis. See the list of active and obsolete names for Ustilago. The pathogenic role of Ustilago is unclear. It has been isolated from sputum samples. This may indicate the inhalation of the fungus rather than an infection. Central venous catheter infection due to Ustilago has been reported . Colonies of Ustilago grow slowly and mature in 20 days. They are moist and yeast-like. The colonies later become wrinkled and membrane-like with profuse budding in the medium. The color is cream to yellow initially and becomes tan to dark brown in time. Reverse is pale [1295, 2202]. Blastoconidia are observed. Pseudohyphae and hyphae may occasionally be present. 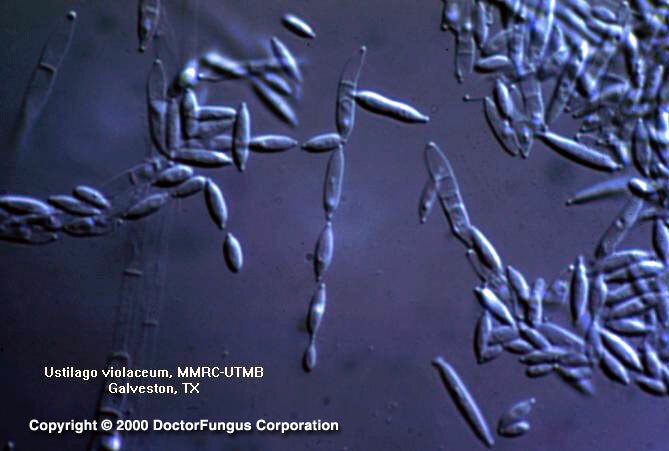 Blastoconidia are spindle-shaped, elongate, and irregular. Pseudohyphae consist of spindle-shaped cells. Hyphae, when formed, are short and have clamp connections. Members of this genus cannot be identified in the clinical laboratory without additional phytopathologic studies [1295, 2202]. Very limited data are available. Per these data on very limited number of isolates, the MICs of amphotericin B, ketoconazole, and itraconazole are low while MICs of fluconazole are variable and of flucytosine are high . Simeconazole, a novel triazole fungicide, is efficacious against Ustilago and appears beneficial for seed treatment and good crop safety .